A limit order is set to either open or close your position at a “better” (not higher) price than the current price. Let’s look at a couple of examples. Limit orders allow you to place an order and name a price at which you want the order to take place. For instance, you may be interested in buying the FTSE 100 index, but only if it reaches a certain level. Using a limit order you can specify that, and the order will not happen unless the price gets there. This serves the purpose of automatically capturing profits without having to monitor the trade on a continual basis. 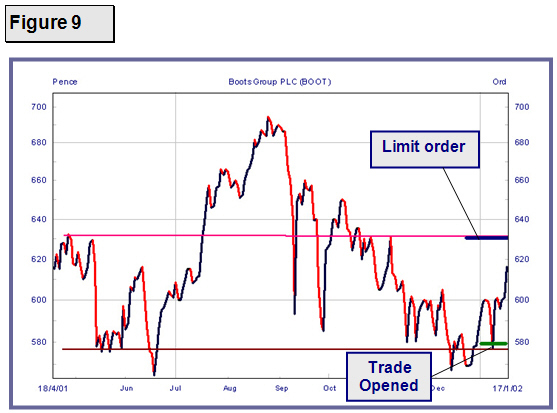 First the most common use of a limit order which is to close a position to take your profit. In Figure 9 above you went long at the green line on Boots Group as the price bounced off a strong support level (brown line). You have identified some resistance just above 630 (pink line) and you decide you will close the trade for profit if the price gets up there again. To do this you set a limit order to close the trade at 630, represented by the dark blue line. It is a limit order because you will close the trade at a better price than the current price. Figure 10 above is an example of a limit order to open a trade. 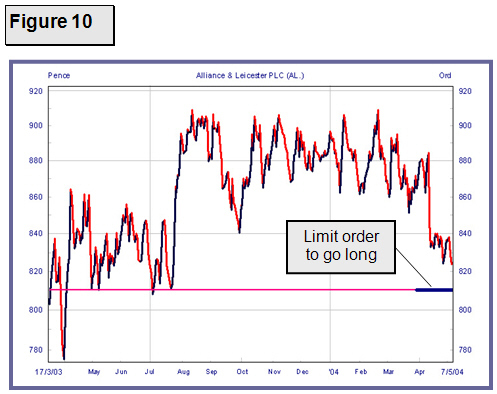 You have identified a strong support level at 810 for Alliance & Leicester. If the price gets down there again you believe it will bounce and rise. You set a limit order to open long at 810 so that if the price goes down there again your long trade will open. This means that the trade will open at a better price than the current price for your trade. This is therefore a limit order. As with stop orders you can set limit orders on short trades as well as the long examples above. If short, a limit order to close a trade will be lower than the current price. A limit order to open short would be above the current price. In both cases your order is at a better price than the current price. Limit Order: An order to trade if the price becomes more favorable is known as a limit order. The spread betting company will then place an UP bet for you (buy) if the December FTSE price drops below 3900. He will do this without further instruction from you. ‘Sell December DOW at a limit 4120.’ They will then place a DOWN bet for you (sell) if the December FTSE price rises at any point above 4120. Of course you can also use limit orders to help you take the emotions out of trading. When you are spread trading it is all too easy to take your profits too soon while letting your losses get out of control. Setting orders in advance of placing trades will help prevent this. One way to do this is to decide on a risk-reward ratio – say, a ratio of 3:1. So, for instance, you might put in limit orders to take gains if the price increases by 90 points and curtail the losses if the market you are speculating on fell on by 30 points. Doing this removes the temptation to take profits too soon and as long as you call your trades right a third of the time you will make money.